Only mid?September, and it was already here: in classrooms, dorms, the dining hall and the library, I heard the frequency of blessings-to-excuse-me grow. 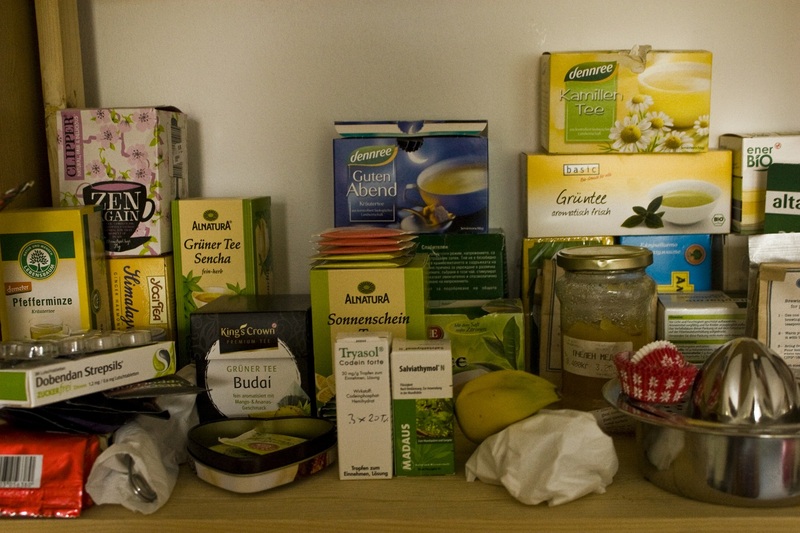 Supermarkets nearby increased their lemon, ginger, garlic and “Erkältungstee” (“Cold” Tea) supplies, and rumors had it that the boom was due to ECLA of Bard students, who, if they hadn’t gotten the cold already, decided to go prophylactic. Some blamed it on the zig-zag-shaped temperature curve in Berlin (as moody as ever), others ? on nature’s dominance over even the dormitory heating system. “Achoo” finally became a more popular word than “soul,” “freedom,” “motif” and “representation,” not to mention “weekend” and “lunch.” Only mid?September, and we took the “red fluffy blankets,” which our Residential Life Coordinator Zoltan Helmich was offering, and we wrapped them around our bodies as life vests. But these were just the first signs, the first evil amulets that the fall flu (or was it a cold? or did I just walk in the rain? or did I eat too much ice-cream?) brandished before our eyes. We shook our ginger and garlic wreaths back, but, alas, it needed some victims. I was witness to one of the first cases, a.k.a. the official opening of the fall cold/flu season. In the kitchen of my dorm, I saw a colleague sitting by the table, motionless, expressionless. It was as if she had entered the kitchen with a purpose but she had forgotten it, so she sat there trying to determine what the purpose was, if there was any. I asked if all’s well. After a while she noticed me and mumbled: “Oh, I am quite sick… I’ve been sleeping the whole day… Now I cannot even go to…”, and she mentioned a very important event which you would normally not miss, even if a bit sick. Her eyes were red; her voice nasal; paper towels were an unmistakable accessory. Paper towels were the new pocket squares those days. It would be an exaggeration to say that a true epidemic happened. Rather, it paid a visit to almost each of us, one by one, not necessarily simultaneously, and bestowed various presents upon us. Surely by this time you intuit what the presents were, so I need not be very explicit here. What seems more striking is this: whatever they were, we did our best to overcome them and, very often, to act as if we were not really sick. And this is where Molière’s “Malade Imaginaire” (“Imaginary Invalid”) is very relevant. “How?”, you’ll ask me, “isn’t Molière’s piece about a hypochondriac––therefore just the opposite”? Well, yes, on the one hand, it is just the opposite; we were sick, but acted as if we were healthy ? I have heard glorious accounts of people going to class, suffering through class––while Molière’s character Argan was healthy but imagined all kinds of symptoms. But, on the other hand, I cannot but mention this one fact that makes the situations similar: the piece was Molière’s last one and he was very ill at the time when he wrote it. More than that, being very ill, he played Argan himself. So, the ill was playing the hypochondriac, i.e. the healthy. Cherry on top of the cake, myth has it that Molière died more or less on the stage, playing Argan… To sum up, Molière who is sick writes about and plays the role of a hypochondriac, who is not sick but thinks he is sick! Are you as confused as I am?! Faced with so many, multiple mirror paradoxes, one wants to start from scratch and ask all those fundamental questions about the nature of sickness: well, but what does it mean to be sick? Is it about sickness happening to you, physically, without you being able to control it, or about you thinking, deciding you are sick? And if some of us decided to bravely avoid the recognition that we were sick, does this mean we were instantly healthy again? In any case, we were some kind of anti?hypochondriacs; in other words, “Imaginarily Healthy”. We struggled. We spoke through coughing and breathed through our stuffy noses and occasionally our foreheads became as hot as tiles on a stove. I painfully witnessed one of my fellow students’ coughing fits. We were both working in the computer room. Occasionally, it would reach him. In the beginning it was only a tickling sensation (I imagine), which he tried to chase away by gently coughing. I say “gently” because this was the first stage of coughing, so to speak ? you could hear that he is on the one hand trying to get rid of the tickling but on the other trying not to overdo, so as not to provoke a real fit. Alas, most of the times it did happen. More coughing followed, in the rhythm of multiplication of radioactive substances, in geometric progression! He would quickly leave the room. Behind the door, a duel took place. Despite his efforts to defeat it, to get it “out,” soon his body became a wretched drum in the hands of the evil force. Coughing is like someone wickedly laughing inside you, I thought. At the moment he is still coughing. Despite all this, I have never heard him complain. In fact, when you meet him in the hallways, he is always smiling, although his face seems a bit tired and “broken” red capillaries cover his eyes. He declares himself an optimist (not “yet” taking real medicine) and his pockets are stuffed with tea bags, which is a new trend, by the way. Besides the “anti-coughing” tea, i.e. “Husten ? und Bronchialtee,” he carries some other, non-therapeutical varieties which are just “to make one feel better” after drinking the not-quite-exciting Bronchialtee. Long live anti-hypochondriacs. Watching all this happening around, I nervously waited for it to come. Luckily, I seemed to be able to avoid it for the most part of September. I was close to believing that, once in my life, I was immune. But, as you can guess, one morning I woke up with a feeling of an incredible weight on my head and with an excruciating pain in my throat that made it hard to speak and swallow. I felt purposeless; or rather, I had no energy to fulfill my purposes. I drank the sourest ginger-lemon teas in my life. I took some serious medicine. When all else failed, I waved the white flag of a paper napkin. This only means that I surrendered to the symptoms, not to the notion of being sick. Never, never was I sick.